Wedding Photo in Hilton Head. Hilton Head South Carolina, about 2.5 hrs from Charleston Sc, and I am there quite often photographing weddings on this beautiful island. Sometime, you capture and photograph the most amazing images on this beach, by having the perfect light and taking that image into your post production and creating an even better image. Thus the case for this image, a small imitate wedding renewal that my clients wanted to do. I was so honored to drive to Hilton Head South Carolina, to capture this for them. My clients invited their family for their wedding renewal, while the ceremony was about to start, the weather radar showed, clouds and storms that were we’ll on the way. The ceremony went perfectly, but God magic made it even better, by creating this amazing light from the sunset, and with my fisheye lens, I was able to step back and reflect what I saw threw my lens capturing this image on the beach in Hilton Head, Sc. Then after coming back to the studio, here in Charleston, Sc, I was able to accent the image in a finer way. 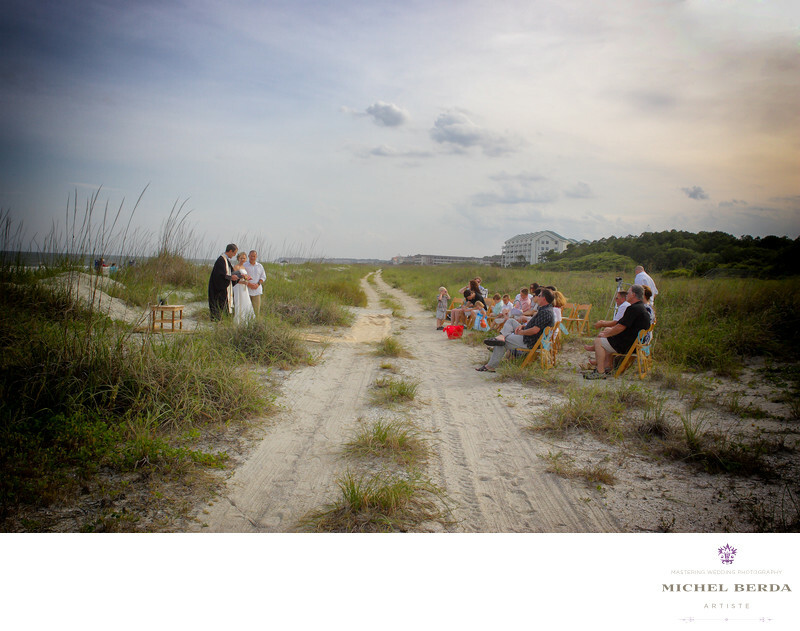 This wedding photo in Hilton Head, Sc, has a great feel to it, the clouds, the green dunes, and the ceremony an image my clients loved when they saw the final results.Keywords: Hilton Head Wedding Photography (3).